Finally….finally! We have had the most beautiful rain here in the Sarasota area for the past 10-12 hours. Having in mind this year’s “Challenge” and remembering that one of our themes is “Drops of Water”, I stepped outside, as soon as it stopped raining, and took this picture. Ah, the beauty of creation! Actually, I got several good shots that would have worked for this theme but this particular picture grabbed my attention. Why? Well, I’ve been trying to train myself to look for “life lessons” that can be learned from the various situations I encounter each day. You see, this solitary vinca plant just appeared in one of our landscape beds a few weeks ago; I didn’t plant it. Perhaps the widow (or her husband), from whom we purchased our home last November, planted it. Maybe the wind blew the seed in from one of the neighboring yards. Who knows, maybe a bird brought the seed from somebody else’s flower garden. No matter who is responsible, the “life lesson” I learned is that what we do now can, and will, impact those that come after us…..positively or negatively. Someone else planted this flower, perhaps years ago, and because they did, my wife and I get to enjoy its beauty!! So my goal today? 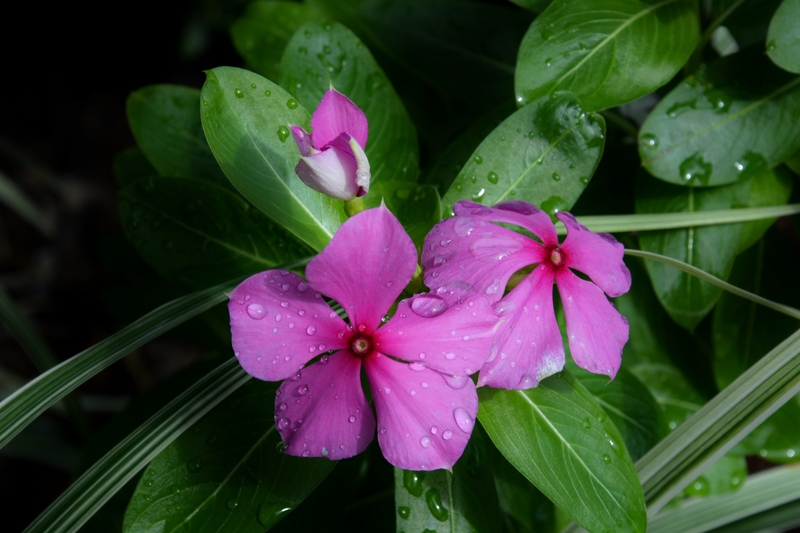 Plant more “vincas”!! One of my favorite subjects to photograph are old buildings, especially barns and churches. Well, as stated in my Week 5 entry, I just returned from a trip to Lower Michigan, where I was born and where I spent my childhood. 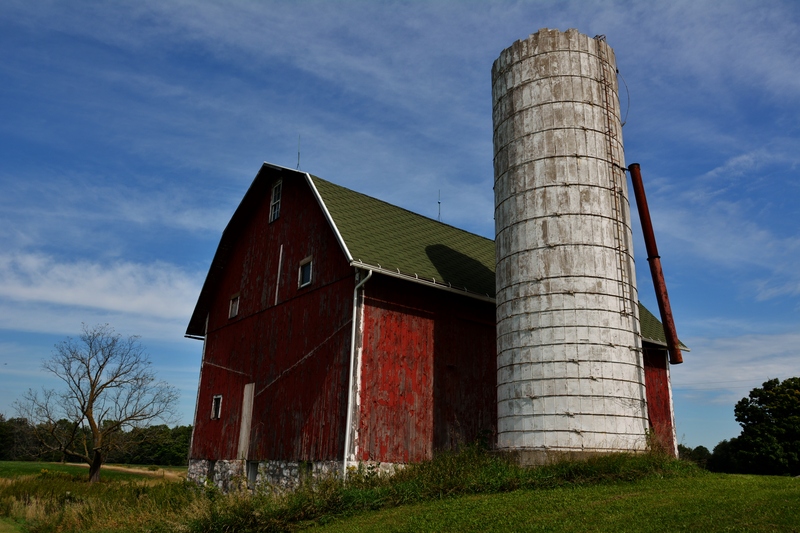 This part of Michigan is farm country and the landscape is littered with stately old barns, many of which date back to the late 1800’s and early 1900’s. Since the day of the “small” or family farmer (one who farms 50-100 acres) is almost a thing of the past, one can find many of these old barns that, for the most part, are no longer being used. These grand old buildings are a piece of Americana that, sad to say, is disappearing from the landscape, the majority falling victim to fire, decay, or neglect. Having in mind “Four-Letter-Word” (Theme #14 on our list), I took this photograph with the intention of using the word “silo”. However, as I studied the picture, I found several other four letter words: “barn”, “tree”, “roof”, “door”, and “weed”. On a side note, this farm is located in Lake Odessa, Michigan, adjacent to where my oldest sister and her husband live. For decades, a man known only as “Whitey” to the locals, farmed the land upon which this barn is located. He lost his wife last year and earlier this year, Whitey himself passed away. So the farmhouse now sits empty………and another family farm becomes a thing of the past. I just returned from a trip to Michigan to check on my five siblings who live there. I carried with me the list of themes associated with our “2014 – 2015 52-Week Photography Challenge” in hopes of being able to check off a few while there. One afternoon, while driving down an old country road, I stumbled upon an unnamed cemetery that I found very fascinating. It was in very poor condition and many of the monuments were simply laying flat, on top of the ground. Most of the grave markers were so worn by the passing of time and the elements, I found it difficult to make out the information inscribed on them. However, in keeping with one of our themes, “Two of Us”, one in particular stood out to me. 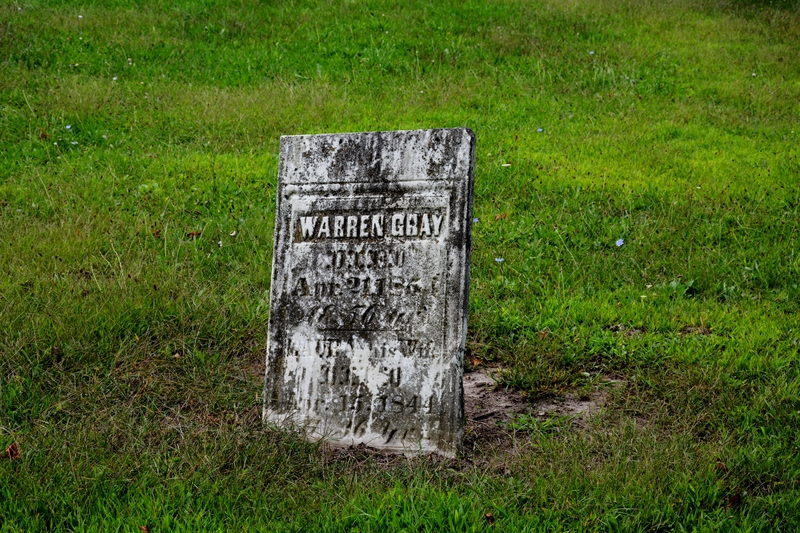 It marked the final resting place of a man whose name was “Warren Gray”, who died at age 54 on April 21, 1854, and his wife, “Laura”, who died at age 36 on April 15, 1844 (you have to look hard but believe me, the information is there!). I couldn’t help but think to myself, “I wonder how long it has been since someone visited this sacred place to pay their respects to Warren and Laura Gray?” I wonder what they were like, what “Warren” did to support his family? Having died so young, I couldn’t help but wonder how “Laura” died? Perhaps disease took her life. Could it be that she died in childbirth? In any event, they probably thought themselves to be mere “nobodies” to the world. Little did they know that 160 years after they died, some jack-leg photographer would stumble upon their tombstone and via a picture taken by the same, draw attention to this couple who existed long ago!! One final comment: take another look at the name inscribed on the top of the tombstone and then note the condition of the marker. Let me know if you get my point!